Despite the lateness of this post I actually finished this swatch in one afternoon. It has been sitting in my house waiting for me to take a photo. I think I was going to iron it, too, but I didn’t. I’m kind of excited to try a larger smocking project in the future. It’s a neat technique and looks so darn cute when it’s done. You can see my pattern clearly and the dark pleating threads are still intact. The first photo is what happens when you remove the pleating threads. I kind of love it. – Smocking is not difficult. I imagine that hand pleating could be tedious, or a larger piece of fabric in the pleater could get cumbersome, but the embroidery is kind of fun and the possible patterns are limitless. I’d like to try to make a garment with it some day. – With my schedule these days I need to take photos and post right away or it won’t get done. Stay tuned for project 42! When Laurie pulled out this odd contraption I wasn’t quite sure what to make of it. It had odd rollers and some needles sticking out, but I couldn’t fathom how it would all work together. 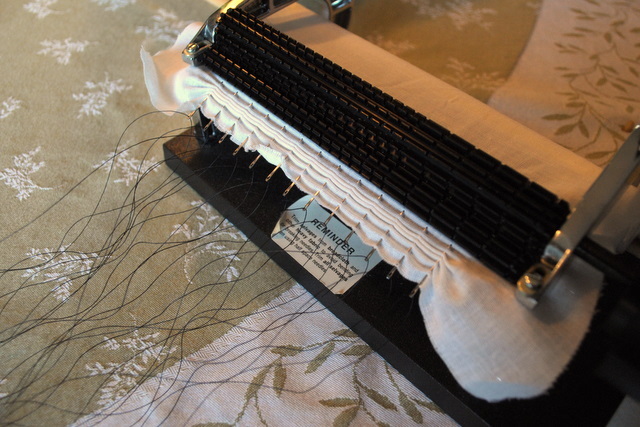 She had me start threading each needle while she ironed our test piece of fabric. You can see in this photo that I have tied knots in the threads to hold the pleats in. 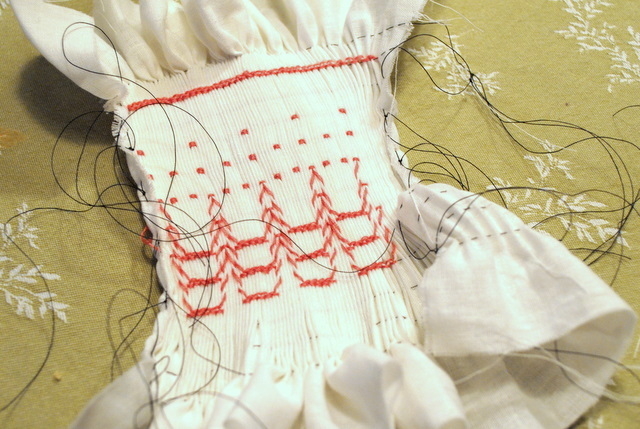 As I worked on the smocking I tied them a bit tighter because I found that these pleats were too loose. Also in this photo you can see the beautiful gather that formed in the fabric below the pleats. Cute! Check back tomorrow for my finished smocking swatch. 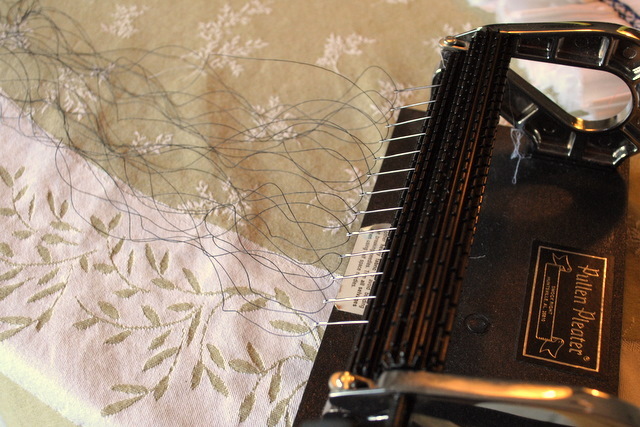 After reading up on smocking for a few days it seems like the kind of tool I want in my future sewing arsenal. When I think about sewing garments the one thing that scares me the most is cutting and sewing accurately to get the right fit. Smocking is sort of a shortcut to that. It takes a wide piece of fabric and gathers it to fit snugly. The embroidered designs are just an awesome decorative bonus. 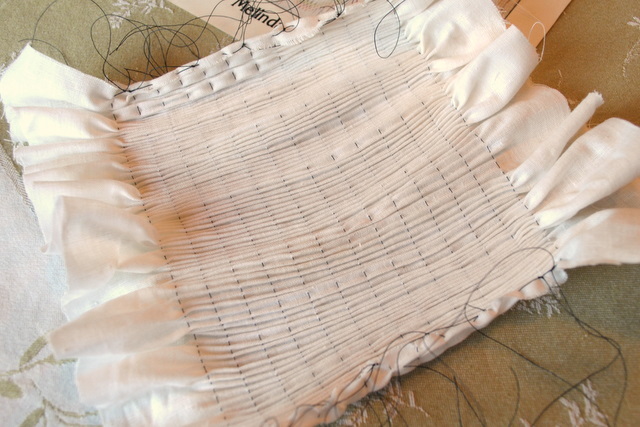 The first step in smocking is pleating the fabric. 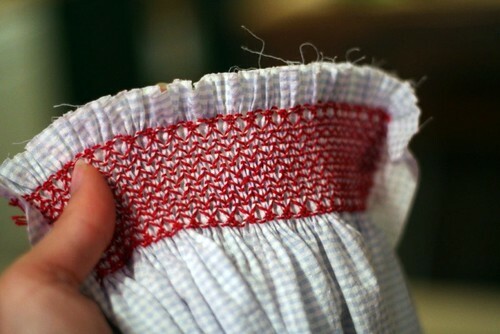 This can either be done by hand or by using a pleater. 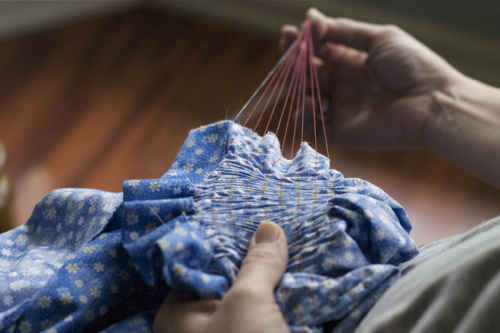 The photo above shows blogger Marie Grace hand gathering her pleats. She wrote a great tutorial for anyone who wants to try pleating by hand: Hand Pleating Fabric Tutorial. I’ll show you a photo of a pleater in action tomorrow. The next step is to embroider the design. The design stitches are what ultimately will hold the pleats in the fabric together. 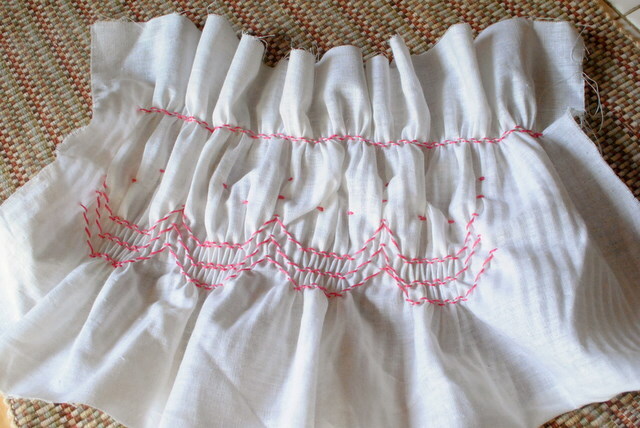 A smocking design is called a smock plate. There are a few free smock plates around the internet. I chose to start with one called Snowflakes by Creations by Michie. I guess it would be helpful to also get some fabric, thread, and embroidery floss, but Laurie had offered to provide all of that for me (thanks Laurie!). Now it’s time to smock! I have had smocking on my list of projects ever since my friend Laurie mentioned that not only does she know how to do it, but she also has all of the supplies. 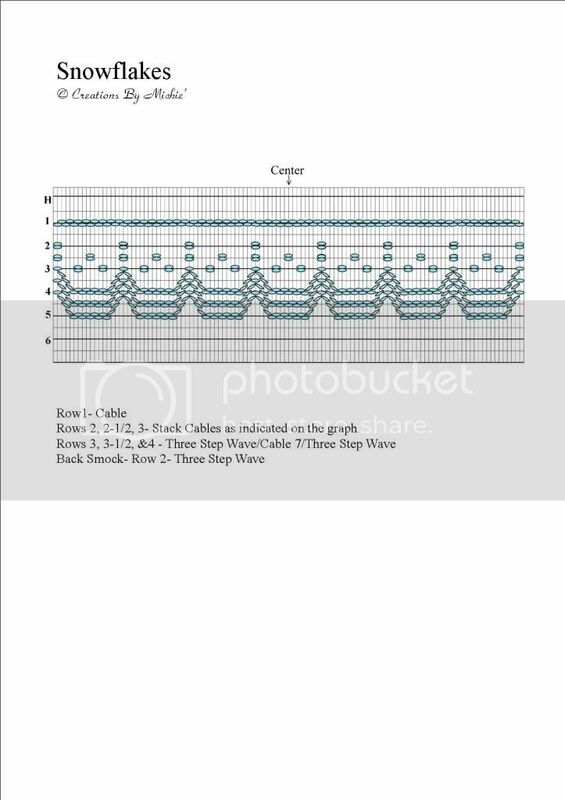 So this week I’ll be going over to her house to learn this awesome embroidery technique. My mind is racing with a whole bunch of ambitious sewing ideas incorporating smocking, but this week I’ll just focus on learning the basics. You are currently browsing the archives for the smocking category.